The Region 21 Fall Meeting hosted by the Greater Omaha Iris Society began Friday evening with a social get-together. 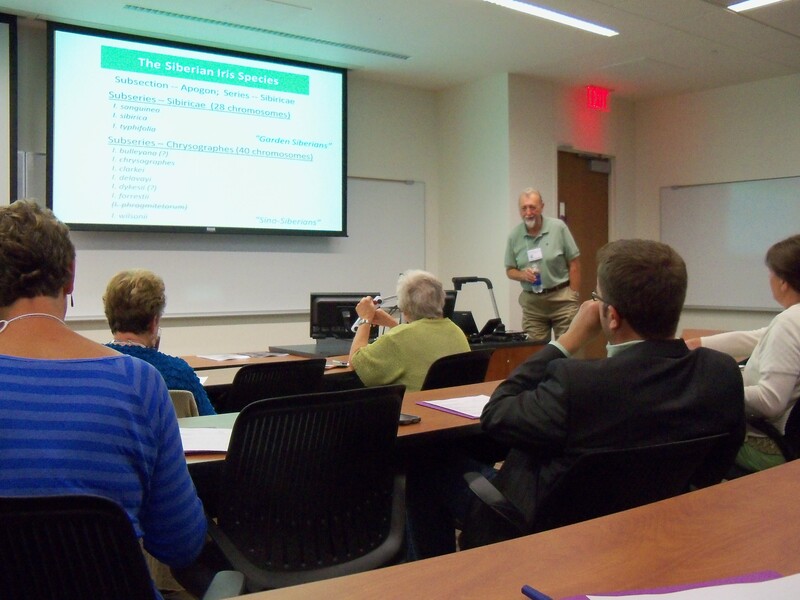 Then Saturday, August 10th, we met at Mammel Hall for a great meeting. Our first speaker was Judy Kiesling, the AIS immediate past-president, discussing AIS Awards and Ballots. She covered a number of timely aspects of the Awards which were announced just a week later. 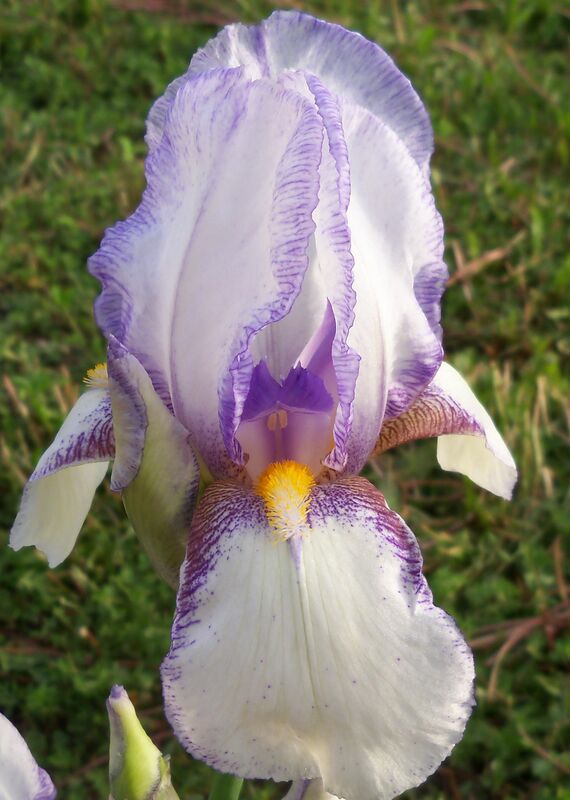 Robert Hollingworth covered Siberian Irises and what to look for and what to look out for. (When the Awards came out, it was apparent his Siberian irises have the desired attributes – he won both the Morgan-Wood Medal for ‘Swans In Flight’ and the Walther Cup for ‘Judy, Judy, Judy’.) He was also our banquet speaker describing A World of Irids with examples from South Africa, Israel, and Japan. Thank you to our host group for a great meeting! Each year the judges of the American Iris Society vote for the top irises based on the irises performance in gardens. The 2013 winners have just been announced! Beginning with the Dykes Medal Winner – ‘That’s All Folks’ by William Maryott, a list of the winners and all the votes can be seen on this Iris Encyclopedia page. In addition to the Iris Medal Winners for all 15 classes, the list also has the Walther Cup (where all classes are eligible) and has the Honorable Mention and Award of Merit irises in each class. Region 21 Notes: The Walther Cup went to the Siberian iris ‘Judy, Judy, Judy’ and the Morgan-Wood Medal for best Siberian iris went to ‘Swans In Flight’ both by Bob Hollingworth who we just heard speak on Siberian Irises at our Fall Meeting in Omaha! Also, if you did not receive the AIS Newsletter News & Notes announcing these winners, please let me know (wrmesser@gmail.com). James Ennenga, a hydbridizer who was active in Region 21 before retiring to Knoxville, TN, died August 2, 2013 at the age of 90. 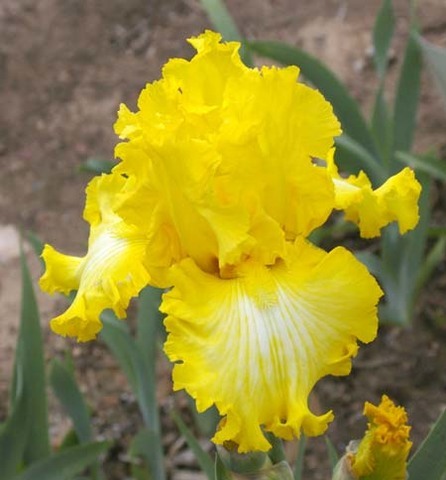 He had been RVP for Region 21 as well as a member of the Greater Omaha Iris Society. His registrations at the Iris Encyclopedia included Border Bearded, Standard Dwarf Bearded, Tall Bearded, Siberian, and Species Iris. An obituary can be found here. Our condolences to his family. Update September 7, 2013: The latest Greater Omaha Iris Society newsletter has a remembrance of him which includes more of his iris activities. It is on page 2 of the 2013 33 Number 6 newsletter. Reminder – the Region 21 Fall Conference is August 9th and 10th hosted by the Greater Omaha Iris Society. If you have not had a chance to register yet, see our earlier post for all the details. Hope to see you there for a great meeting!